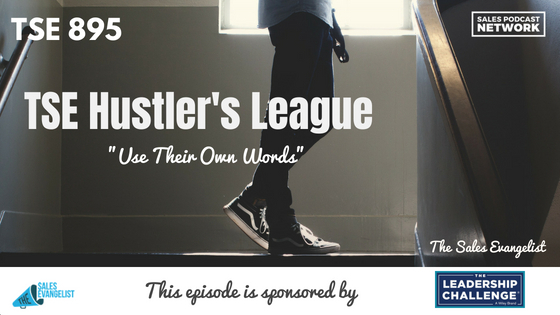 TSE 895: TSE Hustler's League-"Use Their Own Words"
When you’re talking to a prospect, the most important thing you can do is build value into the conversation. Your goal should be to delight them in ways that none of your competitors have. One of the easiest ways to do that is to use their own words. Today we’ll hear a snippet from The Sales Evangelist’s Hustler’s League about ways you can use their own words to demonstrate to your prospects that you’re listening. The Sales Evangelist Hustler’s League is an online group coaching program for sellers of all abilities in all industries. Each semester we focus on different parts of the sales process to help sellers build more value and close more deals. Pay attention to the small stuff, like the challenges they share with you. Whatever they tell you in your initial conversation, jot down some notes. I use a tool to record conversations so I can go back and listen to them. I can take advantage of recapping and listening to things that they said in our initial conversations before our next meeting. If, for example, they tell me that hiring has been a beast because they are losing people left and right, I’m going to use the phrase “hiring is a beast” in later conversations because it demonstrates to the prospect that I was listening. The simple idea that you listened can make a huge difference. It shows that you’re not just an order taker, but you care about the prospect. It isn’t about you; it’s about your prospect. Many times, sales professionals get so focused on what they know about their product that they forget to address what the prospect needs. Imagine an oncology office that uses masks to stabilize a patient’s head during a brain scans. Without the mask, the office can’t complete the procedure, so they don’t get paid. Perhaps the tumor grows while they reschedule the procedure. This prospect doesn’t care whether the masks smell like lavender. They don’t care how comfortable the masks are. They need the masks to arrive on time and to be safe to use. If you’re marketing lavender masks that are comfortable, you’re missing an opportunity. Give the prospect the demo that he wants to see. Personalize it. If you’re demonstrating a copier, set up your demo so that the first document you print on it has the prospect’s name on it. “Congratulations, David!” or something like that. If you use a demo that doesn’t exactly speak to this prospect, he may decide that your demo doesn’t relate to what he’s doing, and he’ll check out of the process. If you’re selling products to finance companies, scan the company’s invoice into your demo so that the prospects see their own documents in your demo. Subliminally, they’ll feel that the process already belongs to them. 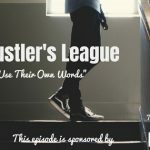 We have a new semester of The Hustler’s League starting in the fall, and we still have slots available. We’d love for you to join us. It’s an online group coaching program designed to help sellers of all experience levels improve their sales production. Our friends at Wiley are offering a 20% discount plus a free excerpt of the book Stop Selling & Start Leading. Based on research and interviews with buyers, the book provides a blueprint for sales professionals. Read an excerpt of the book here. To take advantage of the 20% discount, go to Wiley.com and enter the code SSLSE. If you love this content, leave us a review wherever you consume it and share it with someone else who might benefit from our message. If you haven’t already done so, subscribe so you won’t miss a single episode.